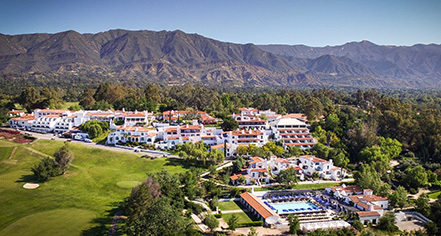 Nestled in the bohemian enclave of Ojai is the historic Ojai Valley Inn, a luxurious retreat that has been one of California’s most revered destinations since opening in 1923. 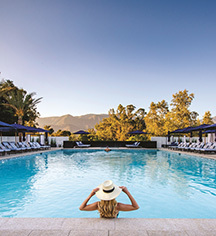 Located just 90 minutes north of Los Angeles, the resort overlooks the unspoiled natural beauty of its mountain surroundings and celebrates the relaxed glamour of California’s past to create an unparalleled resort experience that is quintessentially Ojai. The resort turns the page to a new chapter in 2015 with the unveiling of a series of enhancements that further elevate the resort experience while remaining true to its authentic spirit. Set on 220-oak studded acres, resort guests can indulge in an abundance of active and peaceful pleasures with a George C. Thomas designed golf course; soul soothing spa therapies at the 31,000 square foot Spa Ojai; instruction that encourages creative consciousness in the Artist Cottage; essential oil blending in the Apothecary; multiple pools and more than five dining outlets with settings that range from fast-casual to fine dining. In 2015, the Inn was honored among the Condé Nast Traveler “Top 100 Hotels in the World” editor-selected “Gold List” and was selected by the Travel + Leisure readers as one of the “500 Best Hotels in the World,” affirming the Inn as a treasured historic destination that authentically combines the regions unspoiled spirituality with 21st century luxury. In 1999, the acclaimed golf course was restored, which included the return of two "lost" signature holes. Adjoining Rooms: Available on request. Airport Transportation: None provided by hotel. Please contact concierge for transportation options. Deposit: First night deposit required at time of booking. Early Check-In/Late Check-Out: Subject to availability. Requests only. Extra Person Fees: Extra person accommodations not available. Hotel/Resort Fees & Taxes: Resort fee of $35 per room, per day includes parking, pool access, fitness center, business center, and various other amenities. All reservations may be subject to a 10% local tax. Additional fees or taxes may apply. Pet Policy: Service animals allowed: Yes. Pets allowed: Yes. Services: Room service includes menu, pet’s name outside door, and dog friendly areas. Dog-walking. Dog-sitting. Restrictions: Maximum amount: 2 pets per room. Fees: $150 for first dog, $50 for the second. Transportation: Limo or town car services may be arranged through the hotel’s concierge. Nestled in the bohemian enclave of Ojai is the historic Ojai Valley Inn, a luxurious retreat that has been one of California’s most revered destinations since opening in 1923. Learn more about the History of Ojai Valley Inn .